"Radioactive" and "Radioactivity" redirect here. Radioactive decay modes of an atomic nucleus. Radioactive decay is the process by which an excited, unstable atomic nucleus loses energy by emitting radiation in the form of particles or electromagnetic waves, thereby transitioning toward a more stable state. 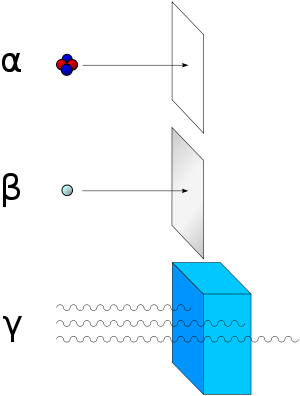 The atomic nucleus comprises certain combinations of protons and neutrons held in a stable configuration through a precise balance of powerful forces: The strong force holding the protons and neutrons together is powerful but very short range; the electrostatic repulsion of the positively charged protons is less powerful but long range; the weak force makes the neutron inherently unstable and will turn it into a proton if given the chance. This balance is very delicate: a uranium-238 nucleus has a half-life of 4.5 billion years while uranium-237 with just one less neutron has a half-life of 1.3 minutes. If there is an imbalance in these forces, the system will eventually shed the excess by ejecting radiation in some combination of particles and wave energy. The most common radioactive decays occur in response to one of three possible types of imbalance. If the nucleus has too many neutrons, one of its neutrons decays (through beta decay) into one proton plus two fragments ejected from the nucleus, a neutrino and an electron (called a a beta particle). If the nucleus has too many protons, it undergoes alpha decay by ejecting two protons and two neutrons as an alpha particle. If the nucleus is excited (has too much energy) it ejects a gamma ray. Materials exhibiting radioactive decay have yielded widespread application to enhance human welfare. The various applications take advantage of the different decay properties, different decay products, and different chemical properties of the many elements having some isotopes that are radioactive. Major types of applications use the radiation either for diagnosing a problem or for treating a problem by killing specific harmful cells. Areas of application include human and veterinary medicine, nutrition research, basic research in genetics and metabolism, household smoke detectors, industrial and mining inspection of welds, security inspection of cargo, tracing and analyzing pollutants in studies of runoff, and dating materials in geology, paleontology, and archaeology. Radioactive decay results in an atom of one type, called the parent nuclide, being transformed to an atom of a different type, called the daughter nuclide. For example, a carbon-14 atom (the "parent") emits radiation and transforms to a nitrogen-14 atom (the "daughter"). This transformation involves quantum probability, so it is impossible to predict when a particular atom will decay. Given a large number of atoms, however, the decay rate is predictable and measured by the "half-life"—the time it takes for 50 percent of the atoms to undergo the change. The half-life of radioactive atoms varies enormously; from fractions of a millisecond to billions of years. The SI unit of radioactive decay (the phenomenon of natural and artificial radioactivity) is the becquerel (Bq). One Bq is defined as one transformation (or decay) per second. Since any reasonably-sized sample of radioactive material contains many atoms, a Bq is a tiny measure of activity; amounts on the order of TBq (terabecquerel) or GBq (gigabecquerel) are commonly used. Another unit of (radio)activity is the curie, Ci, which was originally defined as the activity of one gram of pure radium, isotope Ra-226. At present, it is equal (by definition) to the activity of any radionuclide decaying with a disintegration rate of 3.7 × 1010 Bq. The use of Ci is presently discouraged by SI. The interplay of these forces is simple. Some configurations of the particles in a nucleus have the property that, should they shift ever so slightly, the particles could fall into a lower-energy arrangement (with the extra energy moving elsewhere). One might draw an analogy with a snowfield on a mountain: While friction between the snow crystals can support the snow's weight, the system is inherently unstable with regards to a lower-potential-energy state, and a disturbance may facilitate the path to a greater entropy state (that is, towards the ground state where heat will be produced, and thus total energy is distributed over a larger number of quantum states). Thus, an avalanche results. The total energy does not change in this process, but because of entropy effects, avalanches only happen in one direction, and the end of this direction, which is dictated by the largest number of chance-mediated ways to distribute available energy, is what we commonly refer to as the "ground state." Radioactivity was first discovered in 1896, by the French scientist Henri Becquerel while working on phosphorescent materials. These materials glow in the dark after exposure to light, and he thought that the glow produced in cathode ray tubes by X-rays might somehow be connected with phosphorescence. So, he tried wrapping a photographic plate in black paper and placing various phosphorescent minerals on it. All results were negative until he tried using uranium salts. The result with these compounds was a deep blackening of the plate. However, it soon became clear that the blackening of the plate had nothing to do with phosphorescence because the plate blackened when the mineral was kept in the dark. Also, non-phosphorescent salts of uranium and even metallic uranium blackened the plate. Clearly there was some new form of radiation that could pass through paper that was causing the plate to blacken. Alpha particles may be completely stopped by a sheet of paper, beta particles by aluminum shielding. Gamma rays, however, can only be reduced by much more substantial obstacles, such as a very thick piece of lead. At first, it seemed that the new radiation was similar to the then recently discovered X-rays. However, further research by Becquerel, Marie Curie, Pierre Curie, Ernest Rutherford, and others discovered that radioactivity was significantly more complicated. Different types of decay can occur, but Rutherford was the first to realize that they all occur with the same mathematical, approximately exponential, formula. As for types of radioactive radiation, it was found that an electric or magnetic field could split such emissions into three types of beams. For lack of better terms, the rays were given the alphabetic names alpha, beta, and gamma; names they still hold today. It was immediately obvious from the direction of electromagnetic forces that alpha rays carried a positive charge, beta rays carried a negative charge, and gamma rays were neutral. From the magnitude of deflection, it was also clear that alpha particles were much more massive than beta particles. Passing alpha rays through a thin glass membrane and trapping them in a discharge tube allowed researchers to study the emission spectrum of the resulting gas, and ultimately prove that alpha particles are in fact helium nuclei. Other experiments showed the similarity between beta radiation and cathode rays; they are both streams of electrons, and between gamma radiation and X-rays, which are both high energy electromagnetic radiation. Although alpha, beta, and gamma are most common, other types of decay were eventually discovered. Shortly after discovery of the neutron in 1932, it was discovered by Enrico Fermi that certain rare decay reactions give rise to neutrons as a decay particle. Isolated proton emission was also eventually observed in some elements. Shortly after the discovery of the positron in cosmic ray products, it was realized that the same process that operates in classical beta decay can also produce positrons (positron emission), analogously to negative electrons. Each of the two types of beta decay acts to move a nucleus toward a ratio of neutrons and protons which has the least energy for the combination. Finally, in a phenomenon called cluster decay, specific combinations of neutrons and protons other than alpha particles were found to occasionally spontaneously be emitted from atoms. The early researchers also discovered that many other chemical elements besides uranium have radioactive isotopes. A systematic search for the total radioactivity in uranium ores also guided Marie Curie to isolate a new element, polonium, and to separate a new element, radium, from barium; the two elements' chemical similarity would otherwise have made them difficult to distinguish. The dangers of radioactivity and of radiation were not immediately recognized. Acute effects of radiation were first observed in the use of X-rays when the Serbo-Croatian-American electric engineer, Nikola Tesla, intentionally subjected his fingers to X-rays in 1896. He published his observations concerning the burns that developed, though he attributed them to ozone rather than to the X-rays. Fortunately, his injuries healed later. The genetic effects of radiation, including the effects on cancer risk, were recognized much later. It was only in 1927 that Hermann Joseph Muller published his research that showed the genetic effects. In 1946, he was awarded the Nobel prize for his findings. Before the biological effects of radiation were known, many physicians and corporations had begun marketing radioactive substances as patent medicine, much of which was harmful to health and gave rise to the term radioactive quackery; particularly alarming examples were radium enema treatments, and radium-containing waters to be drunk as tonics. Marie Curie spoke out against this sort of treatment, warning that the effects of radiation on the human body were not well understood (Curie later died from aplastic anemia, assumed due to her own work with radium, but later examination of her bones showed that she had been a careful laboratory worker and had a low burden of radium; a better candidate for her disease was her long exposure to unshielded X-ray tubes while a volunteer medical worker in World War I). By the 1930s, after a number of cases of bone-necrosis and death in enthusiasts, radium-containing medical products had nearly vanished from the market. Radionuclides can undergo a number of different reactions. These are summarized in the following table. A nucleus with atomic weight A and a positive charge Z (called atomic number) is represented as (A, Z). Radioactive decay results in a reduction of summed rest mass, which is converted to energy (the disintegration energy) according to the formula . This energy is released as kinetic energy of the emitted particles. The energy remains associated with a measure of mass of the decay system invariant mass, inasmuch the kinetic energy of emitted particles contributes also to the total invariant mass of systems. Thus, the sum of rest masses of particles is not conserved in decay, but the system mass or system invariant mass (as also system total energy) is conserved. In a simple, one-step radioactive decay, the new nucleus that emerges is stable. C-14 undergoing beta decay to N-14 and K-40 undergoing electron capture to Ar-40 are examples. On the other hand, the daughter nuclide of a decay event can be unstable, sometimes even more unstable than the parent. If this is the case, it will proceed to decay again. A sequence of several decay events, producing in the end a stable nuclide, is a decay chain. Ultrapure uranium, for instance, is hardly radioactive at all. After a few weeks, however, the unstable daughter nucleides accumulate—such as radium—and it is their radioactivity that becomes noticeable. Of the commonly occurring forms of radioactive decay, the only one that changes the number of aggregate protons and neutrons (nucleons) contained in the nucleus is alpha emission, which reduces it by four. Thus, the number of nucleons modulo 4 is preserved across any decay chain. This leads to the four radioactive decay series with atomic weights 4n+0, 4n+1, 4n+2, and 4n+3. In an alpha decay, the atomic weight decreases by 4 and the atomic number decreases by 2. In a beta decay, the atomic weight stays the same and the atomic number increases by 1. In a gamma decay, both atomic weight and number stay the same. A branching path occurs when there are alternate routes to the same stable destination. One branch is usually highly favored over the other. These are the four radioactive decay series. The members of this series are not presently found in nature because the half-life of the longest lived isotope in the series is short compared to the age of the earth. According to the widely accepted Big Bang theory, the universe began as a mixture of hydrogen-1 (75 percent) and helium-4 (25 percent) with only traces of other light atoms. All the other elements, including the radioactive ones, were generated later during the thermonuclear burning of stars—the fusion of the lighter elements into the heavier ones. Stable isotopes of the lightest five elements (H, He, and traces of Li, Be, and B) were produced very shortly after the emergence of the universe, in a process called Big Bang nucleosynthesis. These lightest stable nuclides (including deuterium) survive to today, but any radioactive isotopes of the light elements produced in the Big Bang (such as tritium) have long since decayed. Isotopes of elements heavier than boron were not produced at all in the Big Bang, and these first five elements do not have any long-lived radioisotopes. Thus, all radioactive nuclei are, therefore, relatively young with respect to the birth of the universe, having formed later in various other types of nucleosynthesis in stars (in particular, supernovae), and also during ongoing interactions between stable isotopes and energetic particles. For example, carbon-14, a radioactive nuclide with a half-life of only 5,730 years, is constantly produced in Earth's upper atmosphere due to interactions between cosmic rays and nitrogen. Radioactive materials and their decay products—alpha particles (2 protons plus 2 neutrons), beta particles (electrons or positrons), gamma radiation, and the daughter isotopes—have been put to the service of humanity in a great number of ways. At the same time, high doses of radiation from radioactive materials can be toxic unless they are applied with medical precision and control. Such exposures are unlikely except for the unlikely cases of a nuclear weapon detonation or an accident or attack on a nuclear facility. In medicine, some radioactive isotopes, such as iron-59 and iodine-131, are usable directly in the body because the isotopes are chemically the same as stable iron and iodine respectively. Iron-59, steadily announcing its location by emitting beta-decay electrons, is readily incorporated into blood cells and thereby serves as an aid in studying iron deficiency, a nutritional deficiency affecting more than 2 billion people globally. Iron-59 is an important tool in the effort to understand the many factors affecting a person's ability to metabolize iron in the diet so that it becomes part of the the blood. Iodine-131 administered in the blood to people suffering from hyperthyroidism or thyroid cancer concentrates in the thyroid where gamma radiation emitted by the iodine-131 kills many of the thyroid cells. Hyperthyroidism in cats is treated effectively by one dose of iodine-131. Radioactive isotopes whose chemical nature does not permit them to be readily incorporated into the body, are delivered to targeted areas by attaching them to a particular molecule that does tend to concentrate in a particular bodily location—just as iodine naturally concentrates in the thyroid gland. For studying activity in the brain, the radioactive isotope fluorine-18 is commonly attached to an analog of the sugar glucose which tends to concentrate in the active regions of the brain within a short time after the molecule is injected into the blood. Fluorine-18 decays by releasing a positron whose life is soon ended as it meets an electron and the two annihilate yielding gamma radiation that is readily detected by the Positron Emission Tomography (PET) technology. Similar techniques of radioisotopic labeling, have been used to track the passage of a variety of chemical substances through complex systems, especially living organisms. Three gamma emitting radioisotopes are commonly used as a source of radiation. Technetium-99m, a metastable form with a half-life of 6 hours, emits a relatively low frequency gamma radiation that is readily detected. It has been widely used for imaging and functional studies of the brain, myocardium, thyroid, lungs, liver, gallbladder, kidneys, skeleton, blood, and tumors. Gamma radiation from cobalt-60 is used for sterilizing medical equipment, treating cancer, pasteurizing certain foods and spices, gauging the thickness of steel as it is being produced, and monitoring welds. Cesium-137 is used as a source of gamma radiation for treating cancer, measuring soil density at construction sites, monitoring the filling of packages of foods and pharmaceuticals, monitoring fluid flows in production plants, and studying rock layers in oil wells. Americanium-241, which decays by emitting alpha particles and low energy gamma radiation, is commonly used in smoke detectors as the alpha particles ionize air in a chamber permitting a small current to flow. Smoke particles entering the chamber activate the detector by absorbing alpha particles without being ionized, thereby reducing the current. On the premise that radioactive decay is truly random (rather than merely chaotic), it has been used in hardware random-number generators. Because the process is not thought to vary significantly in mechanism over time, it is also a valuable tool in estimating the absolute ages of certain materials. For geological materials, the radioisotopes (parents) and certain of their decay products (daughters) become trapped when a rock solidifies, and can then later be used to estimate the date of the solidification (subject to such uncertainties as the possible number of daughter elements present at the time of solidification and the possible number of parent or daughter atoms added or removed over time). For dating organic matter, radioactive carbon-14 is used because the atmosphere contains a small percentage of carbon-14 along with the predominance of stable carbons 12 and 13. Living plants incorporate the same ratio of carbon-14 to carbon-12 into their tissues and the animals eating the plants have a similar ratio in their tissues. After organisms die, their carbon-14 decays to nitrogen at a certain rate while the carbon-12 content remains constant. Thus, in principle, measuring the ratio of carbon-14 to carbon-12 in the dead organism provides an indication of how long the organism has been dead. This dating method is limited by the 5730 year half-life of carbon-14 to a maximum of 50,000 to 60,000 years. The accuracy of carbon dating has been called into question primarily because the concentration of carbon-14 in the atmosphere varies over time and some plants have the capacity to exclude carbon-14 from their intake. half life—symbol —the time for half of a substance to decay. mean lifetime—symbol —the average lifetime of any given particle. decay constant—symbol —the inverse of the mean lifetime. Total activity—symbol —number of decays an object undergoes per second. Number of particles—symbol —the total number of particles in the sample. Specific activity—symbol —number of decays per second per amount of substance. The "amount of substance" can be the unit of either mass or volume. is the initial amount of active substance—substance that has the same percentage of unstable particles as when the substance was formed. This relationship between the half-life and the decay constant shows that highly radioactive substances are quickly spent, while those that radiate weakly endure longer. Half-lives of known radionuclides vary widely, from more than 1019 years (such as for very nearly stable nuclides, for example, 209Bi), to 10-23 seconds for highly unstable ones. ↑ Hyper Physics, Radioactive decay series. Retrieved March 19, 2008. Krane, Kenneth S., and David Halliday. Introductory Nuclear Physics. New York: Wiley. 1988. ISBN 047180553X. Martin, Brian. Nuclear and Particle Physics: An Introduction. Hoboken, NJ: Wiley, 2006. ISBN 0470025328. Poenaru, D. N. Nuclear Decay Modes. Philadelphia: Institute of Physics, 1996. ISBN 0750303387. Saling, James. Radioactive Waste Management. New York: Taylor & Francis, 2001. ISBN 1560328428. Seiden, Abraham. Particle Physics: A Comprehensive Introduction. San Francisco, CA: Addison Wesley, 2004. ISBN 0805387366. Tipler, Paul, and Ralph Llewellyn. Modern Physics, 4th ed. New York: W.H. Freeman, 2002. ISBN 0716743450. Turner, James E. Atoms, Radiation, and Radiation Protection, 2nd ed. New York: Wiley, 1995. ISBN 0471595810. This page was last modified on 8 April 2016, at 18:34.